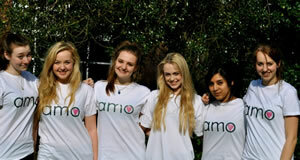 Amo purses, is a charity company funded by Young Enterprise and created from scratch by six Putney High School students with the intent of gaining new business skills and providing a professional and unique product to the public. Amo purses is an original company designing and manufacturing high quality coin purses. Have you ever wished that you could keep your money, keys and oyster card all in one place? "Our coin purses are not only manufactured to hold coins but also have a built in D ring for keys and charms and an oyster card holder on the outside of the purse for easy and quick access to your oyster card. We have designed all of the purses ourselves and handpicked the fabrics used to create their distinctive look." "Amo purses are a bargain at low prices and you will find they quickly become an essential part of day to day life (I know we all have). We hope that you love our purses as much as we do! We also recently won best product, best presentation and best overall company at the South West London Young Enterprise finals and will be competing in the London finals which take place on May 4th".